M2Convert forPSP converts DVDs & multimedia files from any supported format. Convert YouTube videos to the PSP and PS3 supported videos and audios formats. 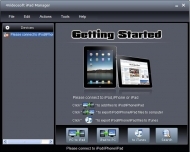 4Videosoft iPad Manager is an all-in-one iPad management software. With the assistance of iPad Manager, you can backup iPad files to computer directly. You can import computer file or folder to iPad/iPad 2 and convert DVD/video to iPad/iPad 2. You also can make iPhone ringtone. Furthermore, totally supports different Apple devices, including latest iPhone 4S. It totally supports iOS 5.1 and supports latest iTunes 10.6. 4Videosoft iPad Manager can convert DVDs, videos, audios to iPad/iPad 2. Numerous editing functions are provided for you to make a personalized video, including: trimming, cropping, merging and watermarking. You also can create iPhone ringtone from DVDs, videos, and audios. The ringtone volume can be adjusted for your preference. You can store the converted files in "My Cache" first, and transfer them to your iPad later. Once you connect your iPad, this software would display your iPad information as detail as possible for your convenience. Quick Search function helps you search files in the categories of Genre, Artist and Album, so as to find your file as soon as possible. With iDoctor Function, it can check your malfunctioned device databases and to repair them. You can edit the ID3 information of any single file on your iPad. You can also add Artwork as the album cover. 4Videosoft iPad Manager is absolutely easy to use. Only a few steps to complete all the iPad management. This iPad transferring software allows you to transfer files between iPad and PC easily and directly. This iPad Manager can also help you transfer files between different Apple devices directly.